If you use computer a lot, after a while it will be running slowly, the performance is not smooth. How to speed up your computer? For most people they prefer use a software to improve your computer's performance. 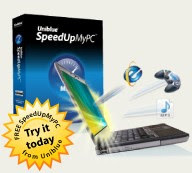 Maybe SpeedUpMyPC 2009 is a choice, it can improve your computer, lets you monitor and control all your PC resources with easy, one click instructions. System settings, internet usage, disk clutter, RAM and CPU are all automatically scanned, cleaned and optimized for peak performance. SpeedUpMyPC 2009 is a commercial software that costs $39.95, but we can get it for free now. How can we get it? This promotion is for Computer Active magazine UK readers. 1, go to Promotion Page. 2, fill your name and email address into a form. 3, check your email that offered. You can find a registration code inside. 4, download and install software with this registration code. All done. Now you can use it with full functions.